If a mod is made to take the video out of the EM1 itself, then the EM1 would be supported as well. This is probably the simplest solution and one that is representative of the original CV/EM1 design. So does that mean that you're now including 12V to the expansion port? I haven't decided how I want to handle it yet. I could just wire up the 12V from the original power connector to the expansion port, or build in a boost circuit to get 12V from the new 5V input. Right now I am leaning towards using the original cv power for the 12V, but could be convinced otherwise. I think this is probably the best option. Only down side to that implementation would be that you would have to disconnect the new 5V supply when you were using the EM1, since 5V from the new supply is going out to the original power connector to power the roller controller. Is doing an AV out of the back of the CV unit for the EM1 a mod that you can offer a service for? Yes I could offer that service. Might be able to do a DIY where all someone would need to do is drill the hole and plug in an adapter board. That might be a little cheaper then shipping the console back and forth. To get the best video out of the EM1 it is necessary to tap directly into the video outputs from the Coleco clone TIA chip in the EM1. These outputs do not reach the expansion port connector and so connections need to be made to the TIA directly. This is why I am placing my s-video out from the side of the EM1. I have found, on my modern displays that taking the video from the EM1 via the expansion port, and converting it to composite, results in a truly terrible picture on my modern LCD displays. That said, there may be some modern displays where the image is better and conversely some where it will be worse. 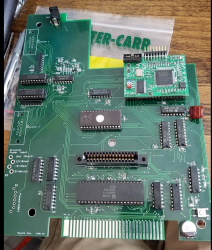 I have found that using the Atari 2600 mod from electronicsentimentalities, wiring this directly to the clone TIA, and outputting S-Video results in a remarkably good picture and one that is infinitely better than RF and composite. Got the boards in a day early. Lots of work to do now. So what components will you be using for the CPU, the VDP and the sound chip? CPU and sound chip will be NOS or salvaged. VDP is F18a only. F18a will be built into the board in future revisions. 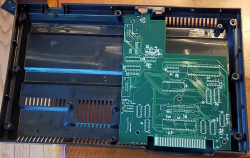 This is just a first rev to make sure there are no issues with the actual colecovision schematic before adding other mods. Sorry for the lack of updates. I've been on vacation and had a couple things come up. The first board has been assembled and I am working through a few issues getting it going. I had an issue with the clock circuit and the reset circuit, but both of those have been fixed. Still an issue with the WR and IORQ lines not acting properly. Edited by Bmack36, Tue Sep 27, 2016 4:55 PM. Congrats on getting this far and good luck with completing this very welcome project. - I would like to see all the chips socketed for easy replacement if the need arises. - I would like to see the DB9 ports not soldered directly to the motherboard to remove these stress points when connecting controllers. Drillings 2 holes each to secure the DB9 ports at the end of ribbon cables to the case is easy enough. I know that these points will add to the overall cost, but i'm sure many amongst us wouldn't mind the added cost or maybe these can be offered as options. 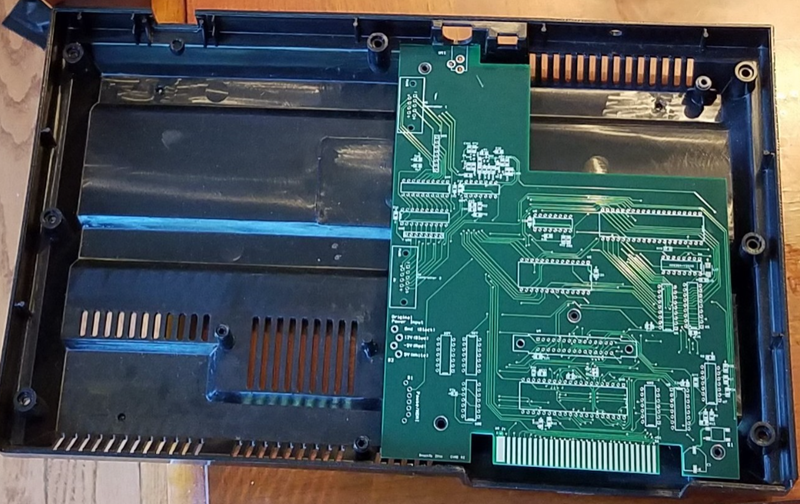 I was planning on using sockets on the final revision, but I wasn't concerned for this rev as it is going to change once I get the main colecovision functionality working. I was planning on using a standard Right angle DB9 that used either screws or was soldered into the mounting holes to provide the strain relief to the board. That should relieve any stress issues during plugging and unplugging. I could always provide a seperate connector for remote ports if required. Like others, I can only support this project. I feel this project gonna be big. When I look at your ColecoVision board, I can not locate the Sound output. This revision is really just a test board to verify the colecovision functionality so it isn't completely finished. The sound output is actually run to the connector in the bottom left corner that isn't populated. (I know, old school) and a 5 to 12v DC-DC converter (simple 4 holes on board) tied to 12v pin on the expansion slot. ​So you could have the possibility of running the whole shebang from one 9-15v powersupply. That's awfully inefficient though, I like Bmack's idea of just running the entire system off a regulated 5V supply and then using a charge pump to get the 12V rail. This looks fantastic. Why not use as much surface mount as you can or (preferably) have dual thruhole / smt tracks on the board? It would easily be possible judging but the size of the PCB. I get that you are prototyping which is fine but if the F-18 is due to be possibly directly mounted on your board then it would make a lot of sense. Just a thought. I agree it's terribly inefficient. BTW we do agree on making 12v from 5. I believe the most durable console out there is the NES. Look at the power input circuit. You can feed it almost anything, and people do. The coleco with it's funny RAM is one of the least durable. If you have a barrel input, to the console, expecting a regulated input, what happens when someone plugs in something that doesnt belong? I know its user error, but why make the same mistakes? I also agree its fantastic work. This will hopefully preserve a few more consoles for future gamers. They're not making em anymore. Edited by cdn2a, Mon Oct 10, 2016 7:57 AM. Cool project. 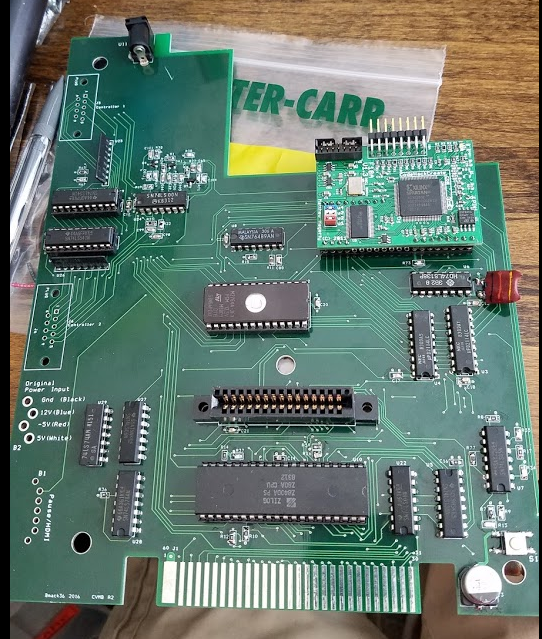 Are you still planning to make a board that will fit the Flashback console? I think the flashback board would probably be on hold. I would think it would need an integrated atarimax and SGM since there is no cutout for the cartridge or expansion ports. Probably best to stick with the Ultimate CV flashback for the near future. Working on a new rev of the board. Found a couple of issues that need to be addressed and test points added to make debugging easier. You could also go with a mini or micro USB connector. There wouldn't be any problems with plugging in the wrong PSU and you could power it from just about any USB charger or even a power bank. Edited by eightbit, Tue Nov 22, 2016 3:40 PM. Motherboard replacement is on hold. A different board is in the works that hopefully will be better . I'll try and give more details when it gets a little further along.